Terry has appeared in all 50 states and has delivered hundreds of talks to those in need of help and those who care for them. Please see Endorsements & Bio for complete information. Terry Wise is an award-winning author and speaker who inspires diverse audiences with a unique story about hope and personal triumph. 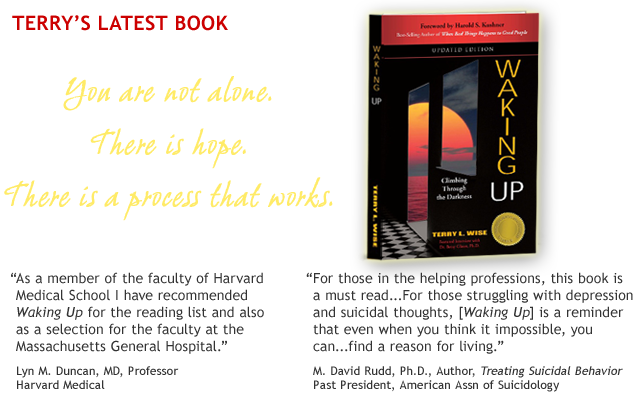 Expounding upon a rare combination of first-hand experiences and pivotal strategies captured in her highly-acclaimed book, Waking Up, she shares insights and tools to restore emotional health. Her story and message are both educational and captivating.